Almost nothing is more frustrating than having saw marks and burns on the pieces we cut for our projects, as they result is us spending valuable “shop time” sanding them out. 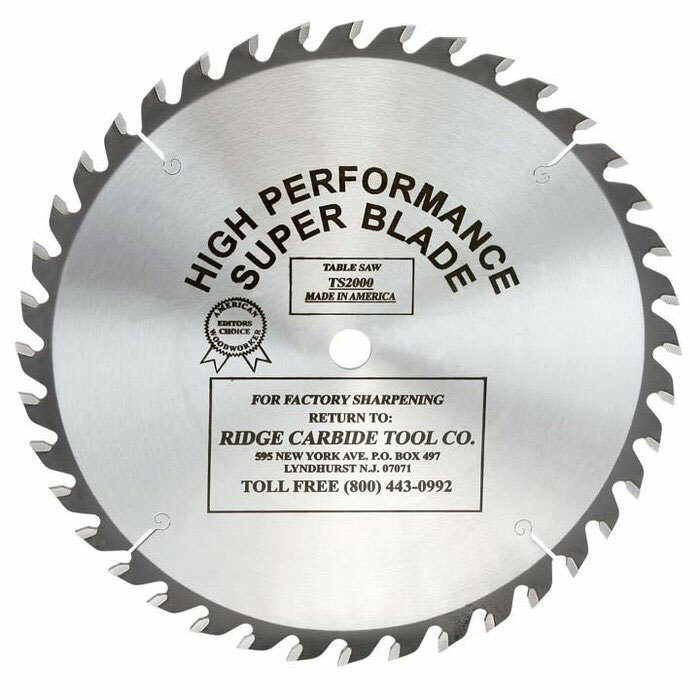 It is for this reason that the only saw blades that we offer on our site (and the only blades I use) are manufactured by Ridge Carbide Tool Co. I have always taken the approach toward our business that I won’t use something that I don’t like, and I won’t sell something that I don’t use. I learned many years ago that “You get what you pay for,” and I also learned that “You can buy a $100 blade once for a lot less money than you can buy a $50 blade 4 times!” We want our customers to be very happy with products they purchase from us, and that is why you will only find Ridge Carbide Tool Company’s blades on our site. I know from experience that you can’t find better blades, and that’s why every blade we sell comes with a 100% Satisfaction Guarantee! I am pleased to let you know that Ridge Carbide has developed a new table saw blade, and proud to let you know that other than buying “Factory Direct,” this outstanding blade is offered exclusively on our website. *** WEB EXCLUSIVE *** NOW ON SALE! cross-cuts on both hard and soft woods, and the high bevel angle and shear face design will give you cuts on veneered sheet goods that compare to the cuts of most “Premium” 80 tooth blades. Due to the very thin (0.060″) plate thickness, the “Ultra Thin” kerf blade requires stabilizers on both sides of the blade. If you do not have two stabilizers, you should order blade number UTS21048UTKAF-WS. Two 4.5″ stabilizers will be shipped with your order. C-4 Micro-Grain carbide tips are 1/3 larger than on the best known blades. *Thin kerf blade. Best for lower powered saws. ** Ultra thin kerf blade. Best for lower powered saws and exotic hardwoods. Note: Sale price above includes shipping and handling costs. Ridge Carbide’s TS2000 blades are Guaranteed to cut super smooth, swirl free cuts without stabilizers for their usable life. Note: TS2000 Series blades in this section have an Alternate Top Bevel with Raker design. This gives a flat bottom cut, which makes them a great blade for making narrow dado or rabbet cuts. If you would like to make box joint projects on your table saw, the Ridge Carbide TS21040FT blade is the perfect choice of blades for you. All 40 teeth on this blade are “Flat Top Ground,” so the blade insures you have cuts with a perfectly flat bottom. 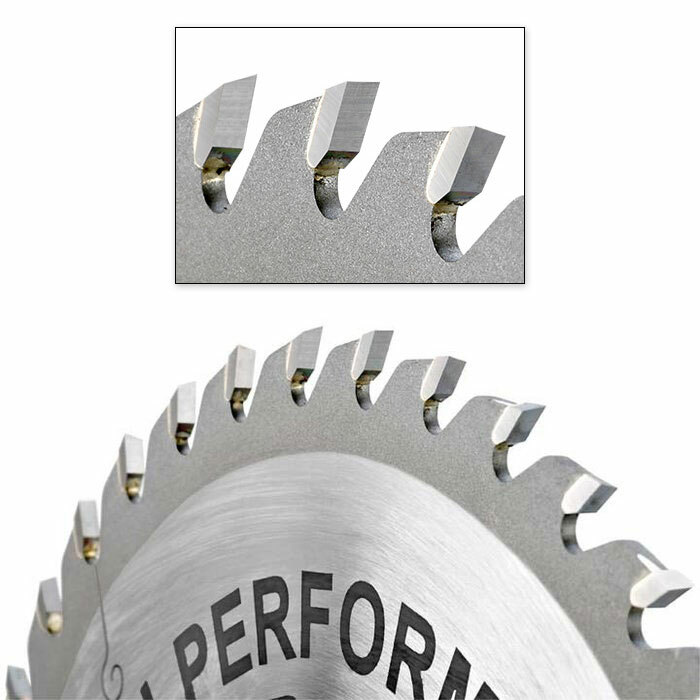 Ridge Carbide’s MC10802 (10” 80 tooth) and DC121002 (12” 100 tooth) blades are designed to give you flawless cuts when working with sheet goods that are covered with melamine and veneer. Note: The blades have a 30° ATB (Alternate Top Bevel) Grind. Exceptionally smooth rips and crosscuts in sheet goods. The RS1000 was the top rated all purpose cross-cut blade in Fine Home Building Magazine. It is the perfect blade for a radial arm saw, chop saw, compound miter saw, and cross-cutting on the table saw. Blades are an ATB with Raker design. The RS1000 will produce scratch free polished cross-cuts on all materials. It will reduce “jump” and give you better “pull control”on your radial arm saw, and will eliminate bottom splintering on radial crosscuts.